Roll-Tech Molding Products, LLC, is your online source for roll products that can be used for retail carts, trash cans, and more! 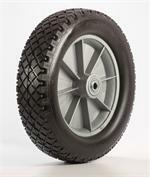 These wheels are made with flat-free polyurethane foam tires for various material handling applications. Our flat-free tires are available in six inches to sixteen inches (6" to 16"), as well as two rim styles (VSP ribs and Superam Mag), multiple bore sizes, bore lengths, and bearing types. Choose the style you need, then click on the picture of the wheel to go to the next selection. 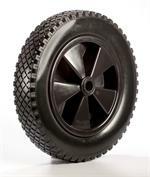 Upgrading your carts or trash cans with new wheels starts with roll products from our business. From high-end flat-free tires to other wheels, our business is dedicated to making sure you have access to quality wheels for your business or personal needs. Read more about the many tires we have available for sale and place an order online today.